1 What Is Reflex Sympathetic Dystrophy? Reflex sympathetic dystrophy (RSD), which is sometimes called complex regional pain syndrome, is a rare condition that affects the sympathetic nervous system. It is characterized by chronic, severe pain that generally affects the extremities. Motor deficits and altered sensation may also be seen in patients with this condition. Patients usually have symptoms in one area; however, their symptoms may spread to other areas of the body. In the initial stages of the condition, symptoms typically present as painful swelling and redness with changes in skin temperature, along with sensitivity to cold and touch. Symptoms can be exacerbated by emotional stress. Irreversible damage can occur over time in patients with reflex sympathetic dystrophy. Uncovering the reason why a patient has reflex sympathetic dystrophy can be tricky; however, there are a number of accepted reasons as to why some patients suffer from this debilitating condition. Stroke, heart attack, spinal injuries, and surgery can all cause severe nerve damage and inflammation. The nerve inflammation and damage that is seen with these conditions may be the reason that the high pain levels reported by patients do not correlate with the extent of their injury or condition. Must Watch Video – What is Reflex Sympathetic Dystrophy? This disease affects the sympathetic nervous system. If the small nerve fibers that transmit information with blood vessels are damaged, they become overactive, which can lead to nerve inflammation. This can disrupt normal functioning of the blood vessels, leading to dilation, constriction, or leaking. 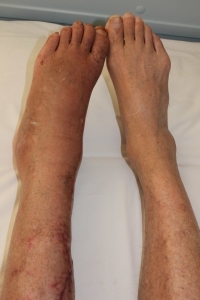 Disrupted blood vessels can cause symptoms in the affected limb. Additionally, the muscles that are supplied by the affected blood vessels may become deprived of oxygen, which can lead to muscle damage and pain, as well as joint pain. Many cases of this pain syndrome can be linked to an injury or traumatic event. The most common types of injuries that lead to this condition are fractures, strains/sprains, soft tissue injuries (i.e. cuts, bruises, etc. ), limb immobilization, or surgical procedure injuries. However, on rare occasions, there is not an identifiable injury or trauma. It is thought that these cases of reflex sympathetic dystrophy are associated with an underlying condition, such as nerve entrapment, blood vessel problems, or infection. To date, there have been very few reports of reflex sympathetic dystrophy occurring among family members and there is limited data available to suggest that there is a genetic link to this condition. Patients who have early onset symptoms of reflex sympathetic dystrophy such as poor circulation, muscle stiffness, muscle atrophy, and loss of flexibility may benefit from physical therapy. Participating in physical therapy in the early stages of the disease may help to prevent the condition from worsening. Some evidence exists that shows that physical therapy may even help to reverse secondary changes in the brain that have been linked to chronic pain. From a pharmacological standpoint, no medications have been approved for the treatment of reflex sympathetic dystrophy. However, a non-steroidal anti-inflammatory medication may help patients who are suffering with moderate pain. NSAIDs are recommended to patients suffering from this condition because they help to reduce inflammation of the affected area and, in turn, help to reduce pain. Oral steroids, including cortisone and prednisone, may also be recommended to help control pain and inflammation caused by this condition. Antidepressant medications are another option for pain associated with reflex sympathetic dystrophy as there is some evidence that suggests that these medications provide relief from neuropathic (nerve) pain. More invasive treatment options, including spinal cord stimulation and intrathecal pumps, are available for patients suffering from severe or chronic pain who do not respond to conservative treatment options. 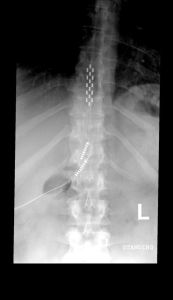 Spinal cord stimulation entails implanting a small device near the spinal cord that delivers electric impulses that help to control pain signal transmission from the spinal nerves. An intrathecal pump works by delivering a small amount of medicine directly into the intrathecal space that surrounds the spinal cord. This helps to prevent pain signals from being perceived by the brain. Alternative therapies that have shown to be somewhat effective for treating pain associated with reflex sympathetic dystrophy include biofeedback training and acupuncture. Biofeedback training involves teaching patients relaxation and coping skills, which allows them to gain some control over their pain symptoms. Acupuncture involves placing needles into certain areas of the body. It has been suggested that acupuncture helps to improve peripheral perfusion in patients suffering from this condition. Treating this chronic pain condition can be difficult as it is often challenging to determine the exact cause of this disease. Discussing your symptoms with your physician will help to determine the best treatment options for your case. Reflex sympathetic dystrophy is a condition that causes chronic, severe pain, usually in the limbs of the body. It is the result of sympathetic nervous system dysfunction. Most cases of this disorder are associated with a known injury or trauma, although there are rare cases where there is no known cause. 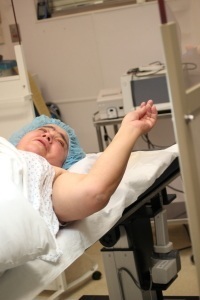 There are various treatment options for patients suffering from this painful condition. Discussing your symptoms and expectations with your physician will help you to decide on the most effective course of treatment for you. Bar A, Eichlisberger R, Angst F, Aeschlimann A. Acupuncture improves peripheral perfusion in patients with reflex sympathetic dystrophy. J Clin Rheumatol. 2002;8(1):6-12. Harden RN, Oaklander AL, Burton AW, et al. Reflex Sympathetic Dystrophy Syndrome Reflex sympathetic dystrophy: practical diagnostic and treatment guidelines, 4th edition. Pain Med. 2013;14(2):180-229. Pertoldi S, Di Benedetto P. Shoulder-hand syndrome after stroke: A reflex sympathetic dystrophy. Eura Medicophys. 2005;41(4):283-92. Stanton TR, Wand BM, Carr DB, Birklein F, Wasner GL, O’Connell NE. Local anaesthetic sympathetic blockade for reflex sympathetic dystrophy. Cochrane Database Syst. Rev. 2013;19(8):[Epub ahead of print].